Peter Alonso has had a season of milestones, including his ballyhooed blast at the Futures Game. On Thursday, he hit another high-water mark. 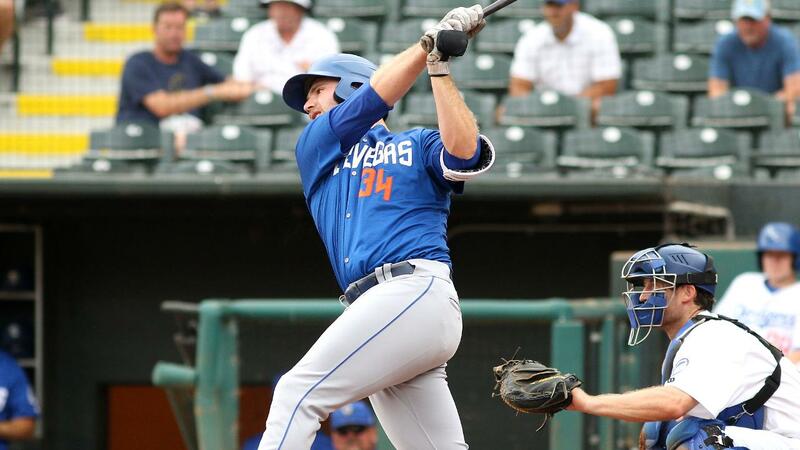 The second-ranked Mets prospect became the first player in professional baseball to reach 100 RBIs this season as he homered, doubled and drove in two runs to help lift Triple-A Las Vegas over Reno, 10-4, at Cashman Field. Boston's J.D. Martinez leads the Majors with 99 and Fresno's AJ Reed stands second in the Minors with 95. In the same game, Reno's Ildemaro Vargas extended his hit streak to 33 games with a single to left field in the eighth inning. The streak marks the longest in the Pacific Coast League since Joey Cora hit in 37 in a row in 1989 for Vegas. Vargas tied John Dickshot (Hollywood Stars, 1943) and Frank Baumholtz (Los Angeles Angels, 1950) for the fifth-longest streak in PCL history. Joe DiMaggio's 61-game run for San Francisco in 1933 remains the standard. It took a while for the 27-year-old shortstop to get his knock. He grounded out in the first, struck out in the third and lined out in the sixth before keeping the streak alive. He is batting .374 (55-for-147) over 33 games. The homer marked Alonso's 13th of the year for Vegas. The right-handed slugger eclipsed the century mark in the fourth inning with the 51s up, 5-0. Alonso ripped a line drive that kept rising and cleared the wall in left-center field, scoring Zach Borenstein. The No. 63 overall prospect batted .314/.440/.573 with 15 long balls through 65 games with Double-A Binghamton prior to his promotion to Triple-A. "He's really been improving every day since he got here. We've been working on drills every day and you can see how hard he works and how much he's progressed, especially with his approach and the mental aspect of hitting," 51s hitting coach Joel Chimelis told MiLB.com on Tuesday. ""When he came up, he had to make some adjustments with his pitch selection and hone his pitch recognition. There's stuff that guys do here that you just don't see at Double-A," Chimelis said. "I remember [Alonso] told me that he never really saw righty-on-righty changeups before and you see that a lot here, and the pitchers will expose your weaknesses. But we've been doing special drills with a short bat and you can see he's getting better every day." Vince Lara-Cinisomo is a contributor to MiLB.com. Follow him on Twitter @vincelara. This story was not subject to the approval of the National Association of Professional Baseball Leagues or its clubs.